TWO ill-matched characters irritably discussing a production of King Lear which we, and they, know will almost certainly never happen. Add in a strong current of South African political history and it’s hardly a guaranteed success. But such is the joy of the writing and the wit and compassion of the playing, that this smart two-hander is a roaring success and more. 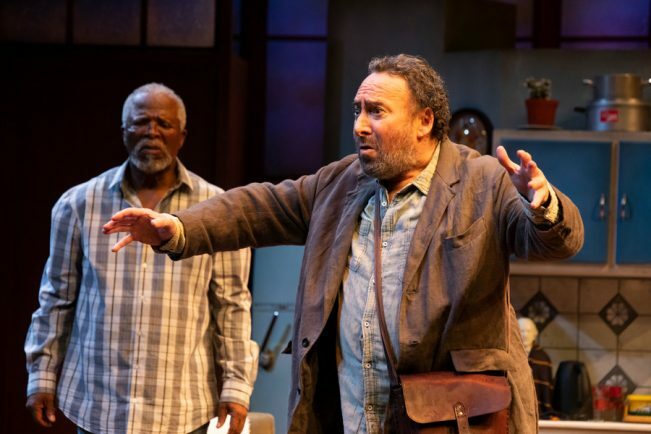 Writer John Kani brings his own words to life as a principled, strong-willed male nurse Lunga contracted to care for Antony Sher’s unashamedly rude actor Jack struggling to cope with terminal liver cancer. It’s a relationship which suffers many battles in defining itself. What one believes is an employer’s relationship with his employee the other sees as an equal partnership in care. Initial stand-offs gradually give way to acceptance, grudging respect even and finally to the possibility of friendship of a kind. There are recriminations and painful memories but, for all its weighty political background, essentially this is always a story about two men coming to terms with what’s happened and what’s around the corner. Of course there is the temptation to view King Lear as being a metaphor for the old South Africa handing over its power to a younger, far from perfect generation. But that temptation is gloriously blown away when Sher’s Jack makes exactly those points from his chair heaping scorn upon anyone daft enough to think it. The laughter only just masks the sound of the nation’s theatre reviewers tearing up their notes. We get a change of scene for the final segment as Jack somehow finds his way to Lunga’s home. Swapping home territory makes for a few subtle changes in the relationship as Jack’s earlier outbursts about being in charge in his home are now reversed against him. Lungiswa Plaatjies provides suitable music and Birrie Le Roux’s design is nicely cramped, chaotic and full of detail. Janice Honeyman keeps the pacing just right and allows the relationship between the two men to develop gradually. There is a huge danger in two-handed plays as didactic as this that they slip into heavy politicising, sacrificing any kind of theatricality for a rather dull take-it-in-turns lecture. Not so here. There’s a wealth of very funny, very visual comedy, and some excellent physical stage pictures. Never dragging in its hour-and-half running time it remains watchable throughout.